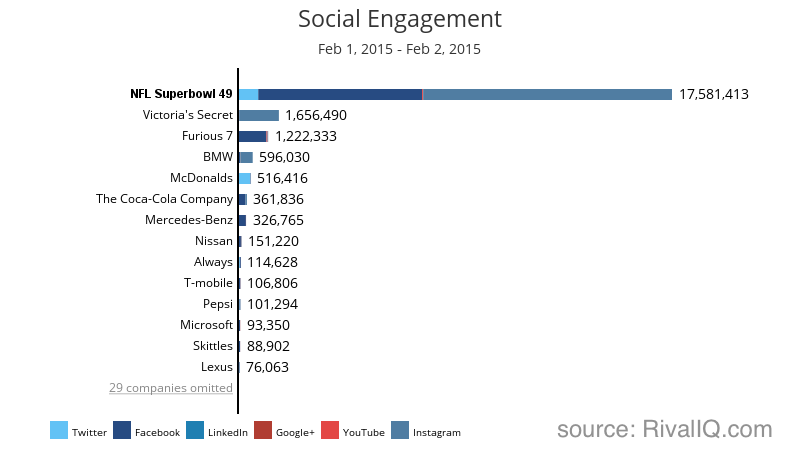 Who won Super Bowl 49 on Social Media? We all know it now — in Super Bowl 49, The Seattle Seahawks and the New England Patriots left their bodies on the field as they battled for the NFL’s Lombardi Trophy. While all of metro Seattle is still smarting from the loss, and New England continues to celebrate, I thought it would get my mind off of the game to take a look at the results from the Super Advertising that took place during the Super Game. 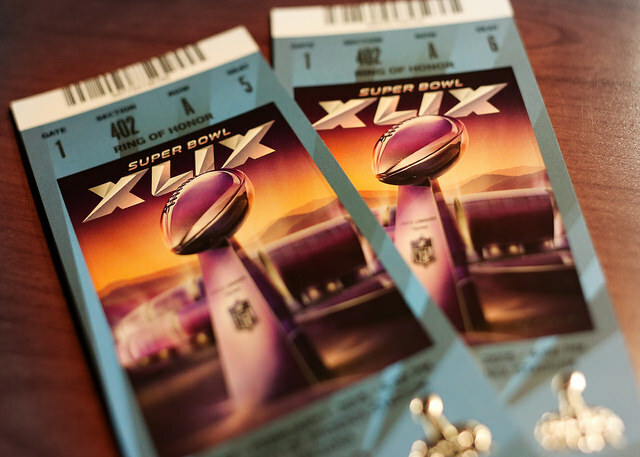 $4.4 million was the going rate for this year’s Big Game, so clearly the biggest winner was NBC — the owner of all of that valuable advertising time. And many of the brands that advertised during the game generated a lot of engagement on social media — so I thought it would be interesting to compare the Battle for Super Bowl Attention across a number of different channels for all of the Super Bowl 49 advertisers. Tl;dr: Increased social media activity does not equal increased engagement. Spoiler Alert: The final score in the Ad Game — measured by Social Engagement — reveals that the NFL was the biggest winner of all in its biggest game. By engagement, I mean the total number of “engagement actions” across all tracked social channels. This includes things like retweets and favorites of Twitter posts; likes, comments, and posts on a company’s Facebook page; likes, dislikes, and comments on YouTube videos; likes and comments on LinkedIn pages; plus ones, comments, and likes on Google+ pages, and likes and comments on an Instagram post. But wait — if 47 companies were competing with advertising during the Super Bowl, did one or more of them win? And by “win” I’m not just talking about the critical acclaim for commercials and asking the bigger question of “did customers care” and by proxy of asking “did they care” it’s also a relevant topic to ask whether they will engage beyond the big game and develop relationships with the brand. Let’s first look at the most engaging posts on Twitter: who did the best from an absolute sense? @MindyKaling combined her Twitter following with her appearance in the Nationwide #InvisibleMindy ad (not the Nationwide ad everyone’s talking about this week) and used the combination of a large following and well-timed Tweet (probably orchestrated as part of the commercial) to gain 48,000 items of engagement. 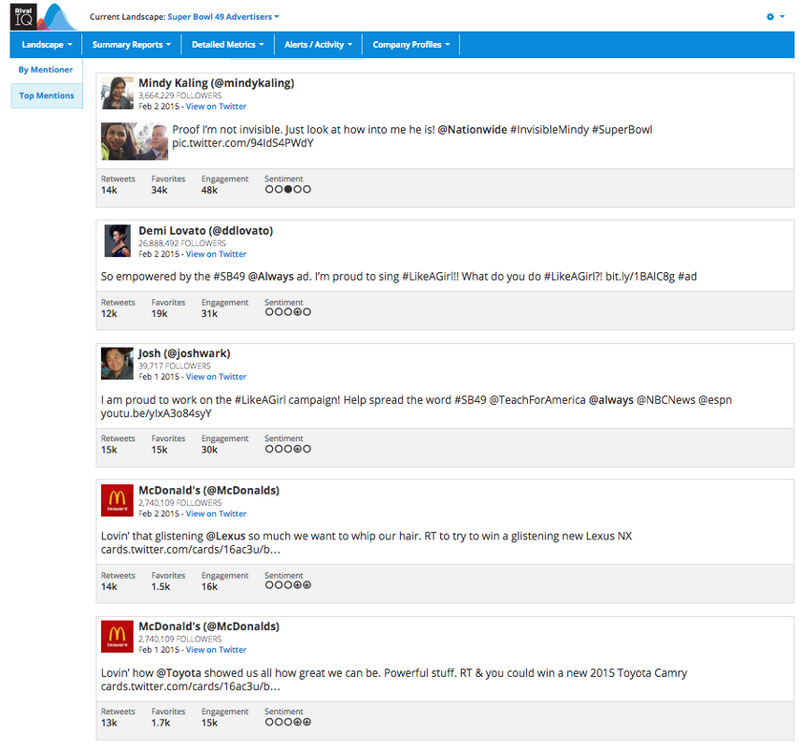 McDonald’s scored success here by mentioning Toyota and Lexus; and the Always #LikeAGirl campaign also got two spots in the Twitter top 5. Engagement Total or Engagement Rate? It would be easy to crown the NFL the Social Winner of Super Bowl 49 simply by looking at the Top 50 Tweets sorted by Engagement Total — that is, the sum of the retweets and favorites for each of those tweets — and that wouldn’t tell the whole story of the Social #brandbowl. The NFL, McDonalds, Always, Pepsi, and Squarespace all had spots in the Top 50 tweets through Sunday and Monday, and here’s a look at the top 5 tweets ranked by Engagement Total. The most engaged tweet by this model is one from the new Fast and Furious Movie, at almost 530x the engagement total of the top Tweets in this Landscape. When we take the same network and look instead at the Engagement Rate — the number of engagement actions divided by 1000 followers — this normalizes the activity between larger and smaller accounts and the story on Twitter is different. 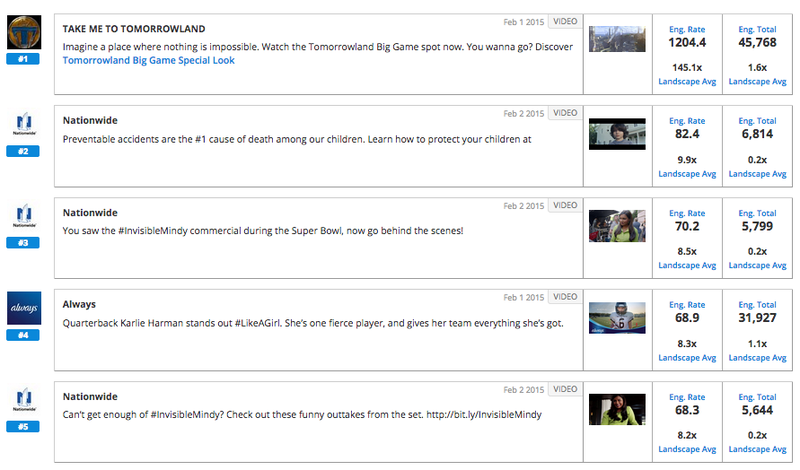 When you see the top 5 posts on Twitter by Engagement Rate during the Super Bowl, it’s clear that @Always got an amazing response from social media for these Tweets. The Big Ad Game is clearly not just about who will get the most tweets and retweets, but also whether the audience responds the most to a heartfelt topic and is spurred into action. 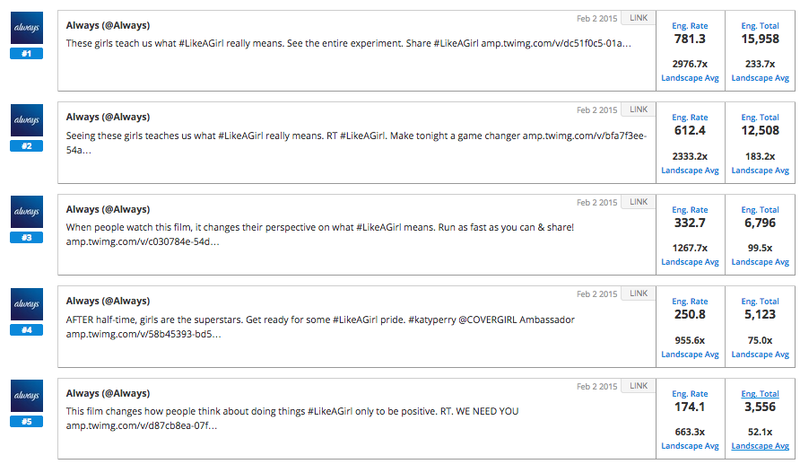 While we don’t yet have solid numbers on how people will engage with the #LikeAGirl meme yet, it seems like a very strong campaign for months (and perhaps longer) for Always. 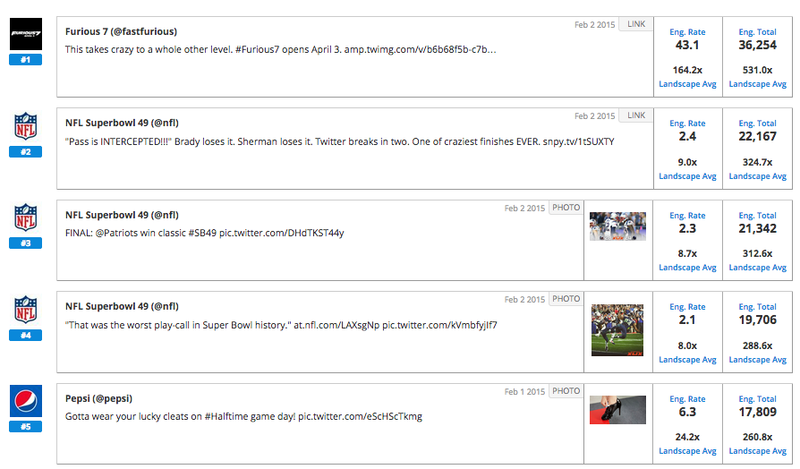 What was the story on Facebook during Super Bowl 49? The story after the game was all focused on Nationwide’s commercial on Preventable Childhood death. Twitter lit up with responses, and former Comcast Customer Service Executive Frank Eliason also wrote a strong rebuttal to Nationwide. Yet the discussion happened as well on Facebook. These are the top 5 Facebook posts by Engagement Rate — the clear winner was Disney’s Tomorrowland movie, and the most intense discussion (commenting and sharing) also revolved around Nationwide. At the same time on Instagram, the highest engagement resulted from puppies, celebrities, and bikini-clad Victoria’s Secret models, perhaps revealing a younger demographic looking for different things from a photo-based social service. And yet some of the most successful posts did not seem to have very much to do with the Big Game. The NFL did a great job of engaging here as well, using pseudo-contests and other posts to get fans of the Seahawks and Patriots to do their thing. On YouTube, two videos everyone wanted to engage with were the Esurance “Say My Name” commercial and Nationwide’s Make Safe Happen. On YouTube, it looks like people were carrying along the discussion they started on Facebook and Twitter. And who were the top 10 overall on Twitter? The story overall for the Super Bowl on Social Media definitely focused on Twitter, and as expected the NFL had a runaway success for the day. A few of the brands in the top 10 for Engagement Total seem obvious, and there were a few surprises (Always and Avocados from Mexico). 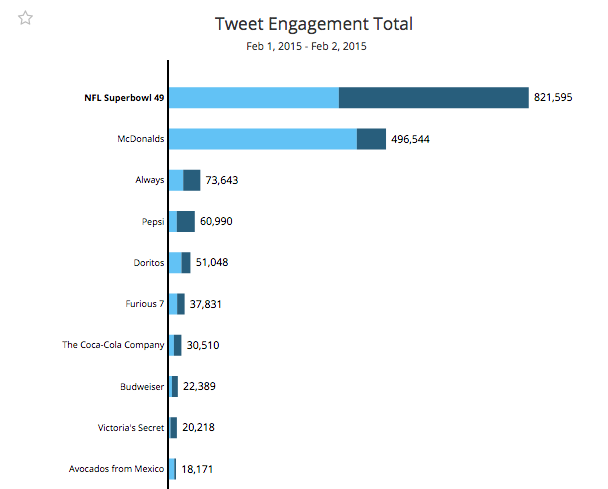 How did I make this analysis of the Super Bowl 49 Advertisers and their social activity on the big day? I used Rival IQ — the fastest way to monitor your competitive landscape — it tracks metrics on Twitter, Facebook, Google+, LinkedIn, YouTube and Instagram, and also helps you tune SEO and keyword rankings. Try a 14-day free trial today.